(H. Abu Ali et al.). Chapter 2: Recent developments in bisdiborane chemistry: B-C-B, B-C-C-B, B-C=C-B, and B-C C-B compounds and their biological applications (H. Abu Ali et al.). Chapter 3: Applied Suzuki cross-coupling reaction for syntheses of biologically active compounds (V.M. Dembitsky et al.). Chapter 4: Synthesis of selected biologically active compounds via allylboration (V.M. Dembitsky et al.). Chapter 5: Boron neutron capture therapy (A.K. Azab et al.). Chapter 6: Boron enolates in the syntheses of natural products (V.M. Dembitsky et al.). Chapter 7: Boronated saccharides: potential applications (R. Smoum, M. Srebnik). Chapter 8: &agr;-Aminoboronic acids, amine cyanoboranes, amine carboxyboranes and their derivatives (K. Takrouri et al.). Chapter 9: Environmental aspects of boron (A. Shibli, M. Srebnik). 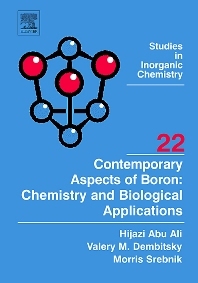 Contemporary Aspects of Boron: Chemistry and Biological Applications highlights the biological activity and applications of boron containing compounds. The authors’ specific approach surveys general features of the subject, while exploring new and novel strategies for preparing certain chemical and natural boron products that are of significant substance in medicinal chemistry. For example, cancer treatment is one of the most important issues related to such products. In addition to contributing to the development of new drugs by addressing biological applications in medicinal and industrial fields, the book provides a comprehensive review of the most relevant components that comprise the pharmaceutical, medicinal and environmental applications of boron containing compounds.